These beautiful Jewels of the Ocean Earrings sparkle with the beauty of the sea. 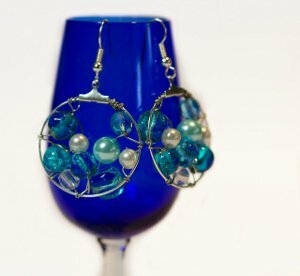 Made with a variety of blue beads and pearls, these earrings are perfect for summer accessorizing and beach beauties. Does blue make you...blue? Change up the colors to create earrings in whatever color you'd like! This is a great tutorial to have in your collection since you can easily alter and change it to suit your needs. Make earrings for all your friends and family and completely change up your accessory collection with this fun DIY earring pattern! Slowly start tightly wrapping the 24 gauge wire 3 times around the start of the earring hoop to form a small coil. Once secure thread on a bead or pearl, then go back onto the earring hoop with the wire and do 1-2 tightly wrapped coils with your pliers to secure. Keep doing this process till you reach the end of the earring hoop. Wrap the coil 3 times tightly around the end of the earring hoop, then turn back around and start working your way back towards the start of the earring hoop. 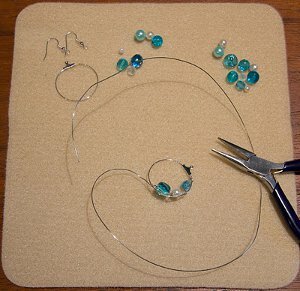 Thread a bead or pearl again, and coil every second gap between the first layer of beads and wire. End it of with a few tight coils at the end, then cut away excess wire. 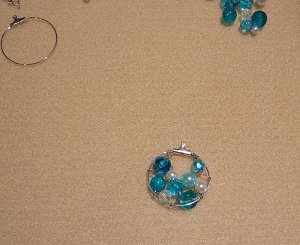 Attach earring hook to beaded earring hook.